Friday Faux Pas: The Bikini Jean | Fashion. Style. Beauty. | Life is short. Live well. We were minding our own business, getting ready for bikini season like everyone else when a friend of our sent this into our inbox. We honestly did a spit take (which, for the amount of money we spend on exotic teas is really a crime). In what is surely a sign of the Apocalypse, someone has combined a pair of jeans and a string bikini bottom. No, they are not two pieces: this is one pair of jeans, a pair of jeans so revealing that we know Victoria has no secrets. They come complete with what appear to be tiny crystal studs on the “bikini bottoms.” We laughed, we cried and then decided to write about it. Now, don’t get us wrong: we love a string bikini and we love a good pair of jeans. Hell, we’ve even been known to throw a pair of jeans over a bathing suit en route to the beach. But unlike the candy marriage of chocolate and peanut butter, these two things DO NOT go together as one item of fashion. 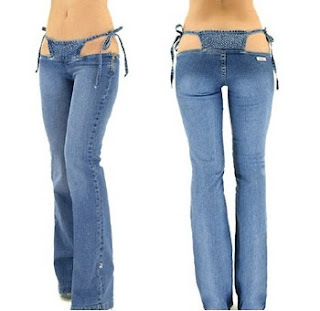 There is no excuse to murder a perfectly good pair of jeans by cutting the waist to mimic a string bikini bottom. Whipping out a Bedazzler just adds insult to injury because, you know, the jeans don’t draw enough attention to your bikini wax that you should have draw ADDITIONAL attention to the area in case you missed it the first time. Here’s the worst part: we all know that the people who will actually purchase and wear this pair of “jeans” aren’t going to actually be the ones with the bodies to wear them. Just wait until the girls from Rock of Love get their hands on these jeans. Let’s keep the genetic experiments in the labs, ok, people? Labradoodles are cute but the combination of a string bikini and a pair of jeans is not. Please put down the daiquiris before you design and cut.